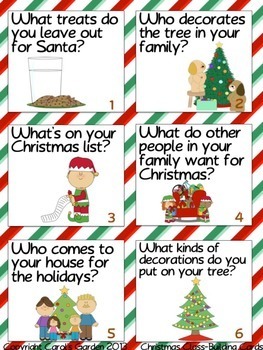 Are your students going a little cray-cray this time of year? 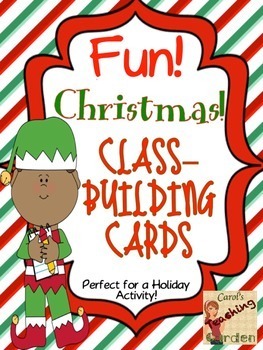 Use these Christmas themed classbuilding cards to keep your students actively engaged before the holidays. 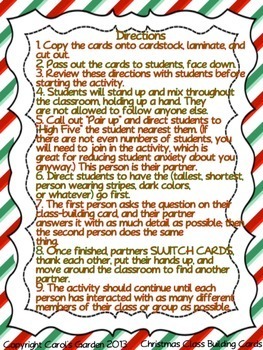 Use these cooperative learning strategies to improve class culture. Students will love getting up and moving around with their classmates to burn off a little of that holiday excitement, all while strengthening class rapport. 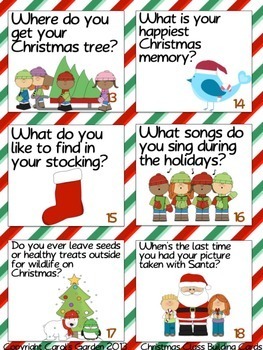 Students learn something about other cultures as they ask questions about other students’ Christmas and holiday traditions. I hope you all have a Very Merry Christmas, a Happy New Year, and a Joyous Holiday Season! Please note, this item is not to be posted anywhere on the Internet, even a class or district website, as doing so allows my work to be copied by others. Thank you. This license entitles one teacher to download the product fro their personal classroom use only. If you wish to share this product with others, please purchase discounted additional licenses when purchasing this product. Thank you!